Here is a list of new job openings our dealers have informed us about. Keep in mind that this list is by no means comprehensive. For a complete list of their openings, we advise you to visit their websites. View our complete list of Authorized Dealers. To apply, please visit https://www.houle.ca/current-career-opportunities/ and click on the listing for "System Technician, Controls – Team Lead”. Opportunity will remain open until filled. To apply: To apply for this positions, email your resume & cover letter, with the position title in the subject line, to “jobs@casiusa.com“. Cornerstone Automation is a locally owned and operated company which specializes in Building Automation Systems, HVAC Service, and Mechanical Installations. We have a rich history in the Chattanooga, TN area with long-term clients including hospitals, banks, and a variety of commercial businesses. The successful candidate will become a resident of the Chattanooga, TN area and become a part of our local family. Chattanooga is a vibrant and well-developed area offering a wide range of activities for singles and families. Our area is teeming with attractions, restaurants, coffee shops, bars, and all sorts of outdoor activities. The downtown area offers a wide array of businesses within safe walking distance from our 8-mile Riverwalk to the downtown boat landing and walking bridge. We are looking for an enthusiastic and innovative individual to help develop our business in a rapidly growing environment. This role will primarily be focused on Building Automation System installation, programming, and creating graphics of new and existing systems. If you are looking to work for an established company that has been with Reliable Controls for 20 years, apply with us today!! Visit https://www.casiusa.com/about-casi/careers/ for more details. Candidate should possess general knowledge of building automation systems, HVAC controls, electrical concepts and facility operations. The candidate should have strong organizational skills with the ability to successfully manage time and financial constraints. The ability to work independently and prioritize work load is crucial. In addition, the candidate should be an analytical thinker with the ability to work through potential project barriers. Proficient computer skills and experience with automated design and programming tools are essential. The successful candidate should possess excellent interpersonal, verbal, and written communication skills. Perform preventative maintenance and diagnostic procedures on building automation systems and components according to the Service Agreement. Test and verify system reading and end devices to ensure that the system is functioning at an optimal level. Make recommendations for improvements and repairs or updates as needed. Coordinate new building automation systems installations with Project Manager and with electrical, plumbing, and mechanical contractors as required. Identify additional opportunities including time and material work, system upgrades and service contract expansions. 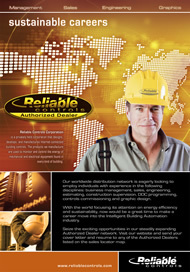 Perform onsite repair, replacement, adjustment and/or calibration of automated building system components. Check indicated point of trouble, then analyze full requirements of system involved and test accordingly. Diagnose problem, determine action for correcting it, and make decision regarding remedy. Conduct training and development classes for customers while onsite. Deliver technical support, coaching, direction to end users and field labor when applicable. Submit work orders and maintain accurate time records to be used for accounting purposes, historical intercompany data and customer confirmation of services rendered.